Back in February 2018, Netflix snatched up the rights to the upcoming animated series based on the best-selling The Last Kids on Earth books by Max Brallier. And today we have word on just which Hollywood heavy hitters will be lending their voices to the new kid-zombie comedy. 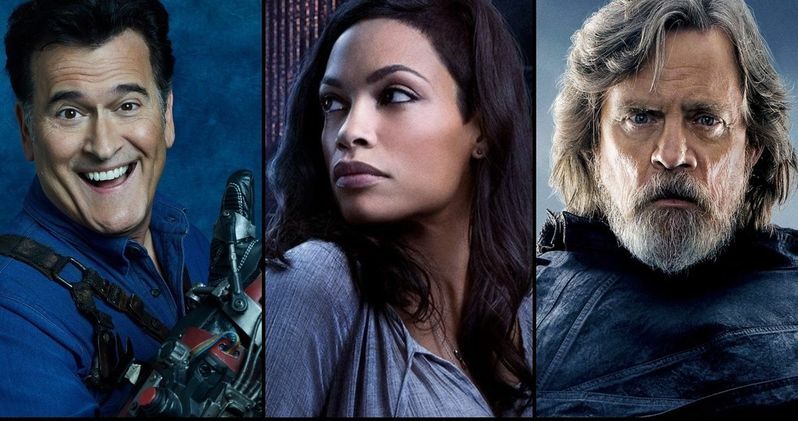 The voice cast includes the talents of Mark Hamill (Star Wars: Episode VIII - The Last Jedi, Batman: The Killing Joke), Rosario Dawson (Zombieland: Double Tap, Sin City: A Dame to Kill For), and Bruce Campbell (Ash vs Evil Dead, Burn Notice) among others. The Last Kids on Earth follows 13-year-old Jack Sullivan and a band of suburban middle schoolers who live in a decked-out tree house, play video games, gorge themselves on candy, and - oh, yeah - battle zombies in the aftermath of the monster apocalypse. It's said to be a hilarious series filled with wisecracking kids, crazy gadgets, a lifetime supply of zombies and giant-sized monsters. Sounds good to me! In addition to sporting the incredible voice talents of the above-mentioned cast of Mark Hamill, Rosario Dawson, and Bruce Campbell, the series has also recruited some further talents that just might make your head spin. Further voice talents for Netflix's animated adaptation of Max Brallier's The Last Kids on Earth includes Catherine O'Hara (The Nightmare Before Christmas, Home Alone), and Keith David (Todd McFarlane's Spawn 3: The Ultimate Battle, Tales From the Hood 2). They will be joined by Garland Whitt (Unsolved: The Murders of Tupac and the Notorious B.I.G. ), Montse Hernandez (Ben 10, Jane the Virgin), and Charles Demers (My Little Pony: Friendship Is Magic). And finally, Stranger Things actor Finn Wolfhard's brother Nick Wolfhard (Howard Lovecraft and the Kingdom of Madness) will voice the lead character, Jack Sullivan. "The way the series resonates with readers around the world - it's absolutely humbling. I'm so pleased that the adventures of Jack Sullivan and his friends will continue to grow, both on the page and now on the screen. I couldn't ask for better partners - Atomic Cartoons, Netflix and Penguin - to help me share these stories. And I'm beyond excited to reveal the newest cover while announcing this incredible cast. Seeing these actors bring the characters to life is a dream come true." Yes, as Brallier mentions above, as an added bonus, Penguin Random House has also exclusively revealed your first look at the cover of The Last Kids on Earth and the Midnight Blade. This will be the fifth book in the series and it will be creeping and crawling our way on September 17, 2019. You can go ahead and give the The Last Kids on Earth and the Midnight Blade cover art a look-see below. This new Netflix animated series was ordered by the streaming giant in February 2018 following Atomic cartoon's acquisition of the title back in 2017. Fans of the series need not worry as it looks like this adaptation is in the right hands with Brallier himself participating in the series as executive producer and creator, along with showrunner and executive producer Scott Peterson. On the Atomic side of things, Matthew Berkowitz and Jennifer Twiner McCarron are executive producers. Atomic Cartoons who developed the animated series is all set to pit kids against the walking dead on the streaming giant later this year. This story was originally shared by Deadline.